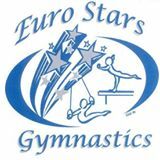 Join us for Blue Moon Babes Classes at Euro Stars! Babies will crawl, interact with their caregiver and instructor in a fun, safe environment, while encouraging the development of gross motor skills! Cost for the session is $105, a $45 annual registration fee applies. Children enrolled in our Blue Moon Babes program get free admission to our week day open gym while they’re enrolled in class! Future Dates! Preregistration recommended, as space is limited! Enrollees get 2 make ups during the session, as well as free stay and play open gym while enrolled!